No matter how you look at this unique, modern loveseat, it’s the perfect small space accent piece to your condo, apartment, kids’ playroom, dorm room and more. With subtle tuft seat stitching, bold seams and chrome legs, you’ll want to use it as both a loveseat couch or sleeper, by folding down the arms. 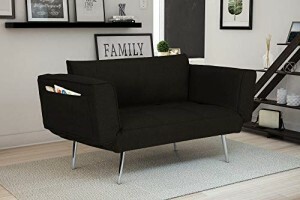 The Novogratz Leyla Loveseat comes in contemporary colors that compliment your living space. Expect your guests to ask where you got it! SMALL SPACE SOLUTION | The Novogratz Leyla Loveseat is the perfect modern solution to your small space needs; great for condos, apartments, dorms and more. LOVESEAT TO SLEEPER | With its multifunctional and innovative design, the armrests fold down to create the perfect couch sleeper. Go from loveseat to sleeper in seconds! EASY ASSEMBLY | Quick and hassle-free assembly, ready in minutes!